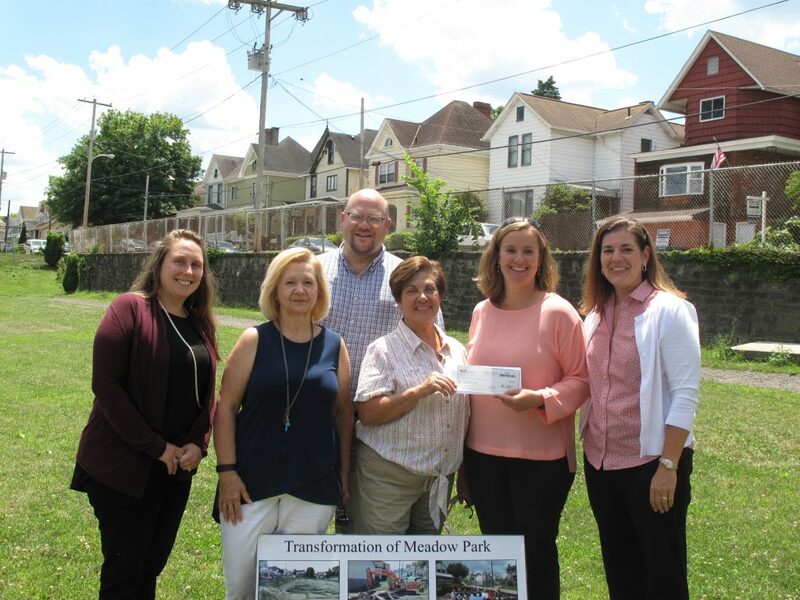 Homestead, Pa., August 4, 2016 – Mon Valley Initiative (MVI) is pleased to announce it has received a $25,000 grant from the EQT Foundation to further support improvements to Meadow Park in Charleroi Borough. Understanding that their ultimate vision of a truly functional and well-loved greenspace in the community had not yet been achieved, the Greater Charleroi Community Development Corporation (GCCDC), with the support of MVI staff, embarked upon a “community outreach blitz” early in 2016 to determine how community members envisioned the space. Responses overwhelmingly supported the development of a passive park with trees, benches, and a gazebo, that could also provide the opportunity for walking, playing, and community gatherings. “We are grateful for the EQT Foundation’s support of this community-driven project and appreciate their investment in the Charleroi community. Their funding is instrumental in helping complete the transformation of a once-blighted lot into a well-loved community asset,” said Patrick Shattuck, MVI Real Estate Director. Meadow Park is strategically located on Fifth Street between Meadow and Crest Avenues and formerly was the home of two Charleroi schools. Following the demolition of the buildings decades ago, a portion of the site was successfully redeveloped by MVI and the Greater Charleroi Community Development Corporation (GCCDC) with new for-sale homes. The remainder was targeted for use as a neighborhood greenspace and the GCCDC completed site work and landscaping as a first phase of the project. In collaboration with Charleroi Borough, a walking track was installed in 2013. MVI and GCCDC are committed to providing the tools necessary for a comprehensive, resident-driven revitalization of Charleroi. Knowing that well maintained greenspaces, like Meadow Park, contribute to thriving neighborhoods and increased property values, MVI knows that importance of seeding neighborhoods with a strong homeownership base. To assist with that, MVI is also operating a down payment and closing cost assistance program to those interested in purchasing a home in Charleroi Borough. Recipients may be eligible to receive up to $10,000 in assistance. The Mon Valley Initiative (MVI) is a 501(c)(3) grassroots coalition comprised of 10 Community Development Corporations (CDCs) and representing twelve municipalities in the Monongahela Valley, all working together to revitalize the economy and to restore the economic vitality of the Mon Valley. MVI’s four program areas are Housing & Real Estate Development, Workforce & Business Development, Housing Counseling, and Community Outreach. Since the EQT Foundation was established in 2003, it has donated more than $37 million throughout EQT’s operating areas. EQT Corporation and the EQT Foundation are committed to the social and economic vitality of our operating regions. Together with a variety of non-profit organizations, the EQT Foundation develops strong partnerships that enrich the diversity and viability of our communities, sustain the principles of continuous learning, and focus on environmental protection efforts. For more information, please see https://www.eqt.com/our-communities/eqt-foundation.